Were you looking for the Ark's control room, the Citadel? The control room of Installation 08. A control room is a crucial facility featured on many Forerunner installations, most prominently those of the Halo Array. The control room of a Halo contains the installation's Core data center, and is used to manage the entirety of the Halo's systems, including its primary weapon, which can be activated by inserting the Activation Index into the Core or even disabled, given sufficient expertise. Other functions include the management of the installation's safety protocols, and control over the Halo's gravity anchors, enabling the ejection of select environmental sections into space. The Halos' control rooms are typically located within a pyramidal temple-like structure. Control rooms are featured on other installations as well; shield worlds, for example, possess dedicated control centers for the Forerunner fleets or weapons they may contain. The interior of Gamma Halo's control room resembles that of Installation 04 in general layout. It was here that John-117 defeated the Ur-Didact following the New Phoenix Incident. The Master Chief utilized the ring's activation index to manually disable the installation's safety protocols, allowing monitor 859 Static Carillon to eject the fragment of the ring housing the control room into the planet below, seemingly incinerating the Didact in the impact but keeping the control room intact. The central chamber of Installation 04's control room. 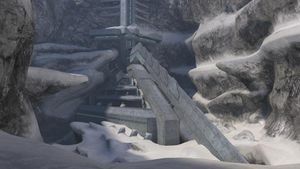 Installation 04's Control Room was a ziggurat-like structure located in a snowy chasm. The main console and Core was located within a massive spherical chamber behind a set of doors and connecting corridors. The room features a massive hologram of Installation 04 and the Threshold system in its center. Suspended in the air is a large circular catwalk. The Master Chief reached the main console and inserted Cortana, who sent him to the installation's Flood containment facility to attempt to stop Captain Keyes from unleashing the Flood. He returned to the Control Room at the start of Two Betrayals to insert the Index as prompted by 343 Guilty Spark, but was stopped by Cortana. 343 Guilty Spark then sent Sentinels to stop the Chief. After the Chief destroyed the Sentinels, he took Cortana and left. Installation 05's Control Room is located on an offshore island in a large body of water. It bears significant structural differences from Installation 04's room. Here, the Jiralhanae Chieftain Tartarus brought Miranda Keyes to the Control Room along with 343 Guilty Spark to attempt to activate Delta Halo. He succeeded in initiating the activation sequence of the installation, but was slain by Arbiter Thel 'Vadamee and Sergeant Johnson. The Index was removed by Miranda before the weapon could fire. Upon activation of the firing sequence, the control room's central chamber reconfigured from its inert state into a three-leveled structure with a gravity lift in the middle. The Control Room for the replacement Alpha Halo is a nearly identical copy of the original ring's Control Room. The temple structure has the same basic triangular shape as Installation 04's Control Room, with a long support beam running from the ground to the top of the structure. There are minor aesthetic differences, including the walkways on each level being more narrow, as well as the tower at the top being replaced by a large flat landing. Inside the control room, the corridors and doorways are reminiscent of Installation 04, while offering minimal changes. The actual control room and control panel is scarcely different from the original. The large dome-shaped room still shows a holographic image of the Halo ring, although Threshold is missing from this image (as the ring has not been moved to that point). The differences in design from the original Installation 04 may be due to the ring's incomplete state, as suggested by Cortana's observation, "Halo. It's so new...unfinished." The control room for Installation 09 is different from that of its predecessors, both in design and location. It now lies below the surface of the installation, and can be accessed by descending from a circular aboveground structure. The control room also features an energy shield for protection. Instead of placed at the corner of a cliff, it appears to be on a large landmass. The Etran Harborage's Apex Site was classified as a form of control room. This facility was an elongated platform suspended in the air high above the interior surface of the miniature Dyson sphere, surrounded by docking towers housing Forerunner dreadnoughts. At one end of the platform was a control panel which, like many Forerunner artifacts, could only be operated by a Reclaimer. The control room was first seen in the pre-Xbox Halo demo in 1999. In the video, the control room was about one third the size of the version later seen in Halo: Combat Evolved. Early concept art of Installation 08's control room, with the Ark in the background. Finalized concept art of the structure, now bearing clear similarities to the original ring's control room. Exterior view of Installation 04's control room. The entrance to the control room of Installation 04. Interior view of Installation 04's control room. Installation 05's control room initiating the installation's firing sequence. Installation 05's control room activates its holographic readout of the Halo Array upon shutdown. The entrance hall of Installation 08's control room. Inside the control room of Installation 08.